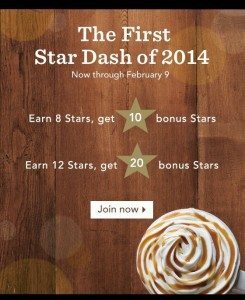 A Star Dash is an invite from Starbucks to earn something extra from Starbucks based upon earning stars within a specified time period. All of the Starbucks Star Dashes represent one-to-one marketing, meaning that they are tailored to the person who receives them. How many stars you need to earn in the dash is based upon your past transaction history. If I earn 40 stars by February 11th, I will get 20 bonus stars. Please do not be alarmed in reading this. YOUR Star Dash may not look like this at all! Some people will get emails that tell them that they’ll earn bonus stars if they earn as few as 8, or 12 stars before the 11th of February. Some of the emails may show the rewards as a $5.00 and $10.00 gift card, depending on what yours looks like! Do not assume that your Star Dash will look like mine. I have heard that there is a lot of variation to this first Star Dash – yours is tailored to you! That’s a little confusing – February 9th or February 11th? I will email an official Starbucks spokesperson and try to find out more information about which of the two dates is correct. As you can see, some people are doing a leisurely Star Walk, and others are on a serious Star Run. 😉 Which Star Dash did you receive? If you are not part of MyStarbucksRewards then what you need to do is this: go to Starbucks and grab a gift card. Put at least $5 on that card. Register it online at Starbucks.com. 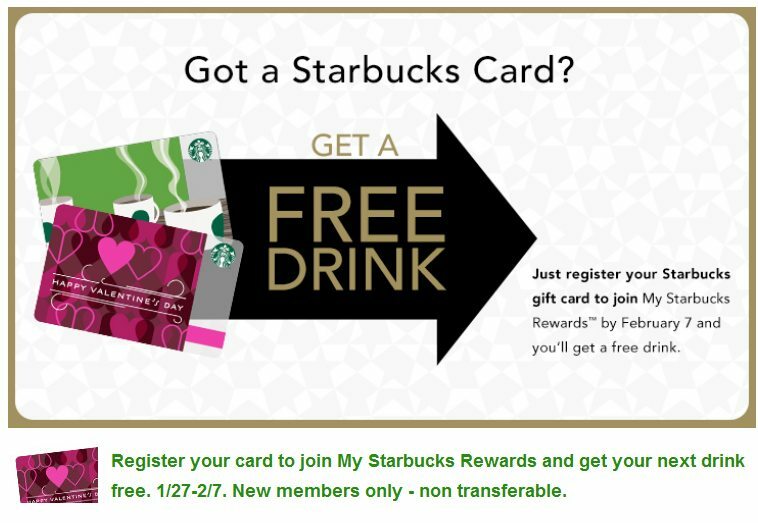 You will get a free drink reward if you register a Starbucks card (your first card; this is not for existing MyStarbucksRewards members) before the 7th of February. And again, your valuable rewards will just expire on you and go to waste unless you take the time to track them. For those of you who do have a Gold Card, keep in mind that you are not required to use it. Use any card registered to your profile. Join now, and get a free drink! If you like browsing different card styles, or more on this topic, please click through the past Starbucks Card articles. Now you know the right end date. Instant Gold! Today Starts New Starbucks Rewards! only one star away from completing my first dash 7/20! What do you have to do on the 18th to claim the bonus? btw… the marketing worked on me. I went from one purchase every other week to 2-3x/week now. 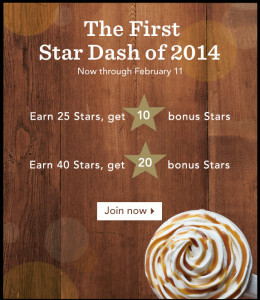 I only needed four more stars to complete the Dash and the whole Dash disappeared from my account on Starbucks.com. What happened? Is there any way to to get the Dash back? I called Starbucks corp. There have been A LOT OF GLITCHES with this latest Star Dash Promo!!!! I can’t even get the SD Promo up on my starbucks account! First guy I talked to said “it wont work if you try to register thru Google Chrome.” 2nd Guy I talked to said, ” no that’s not true. It wont work thru Safari”. ARGHHH! But, he said to KEEP YOUR RECEIPTS. They said to call in (to the toll free number on back of your card) after Feb 11, and they will “settle up” with you!!! I entered the latest star dash and bought a lot of coffees since it started. I have not received an update or any information reguarding the outcome! When will we be notified? Feelin’ lucky – I got a heckuva good offer last week, and then it got even better! First was the star dash- get 8 stars, get a bonus 10; get 12 stars, get a bonus 20. And then I got another “just for me” offer- buy a breakfast sandwich after 2p to get double star bonus (which counted toward the dash) PLUS a BOGO espresso drink before Valentines, which will be at least 1 more when I get there. So I’ve been SUPER jacked up (and now awake at 1:20am, thanks to tonight’s delicious binge) — but enjoyed every gluttonous sip & looking forward to 20 bonus stars coming soon. Oh– and amidst all that, of course I also got my standard free drink for hitting the 12th star. HUZZAH! Is it over? I couldn’t find the place to check how I did! I had to get 40 stars for my big reward! Well phooey.. I don’t believe that for one instant. The comments on this post certainly seemed to confirm the theory that regular customers have gotten the highest targets. Now why couldn’t they just admit it? Emily I’m with you, I don’t believe it was random. It make sense to me that Starbucks would try to entice their customers to increase their visits, and I’m OK with that. I’m not OK with lying. And I think this Star Dash went a bit overboard. For the December Star Dash I increased my visits from 3-5 times/week to 7 times/week to earn the 30-star bonus for 25 stars in 25 days. So this time I got the 25/40 stars in 2 weeks. No way am I going to visit 2-3x daily just to earn 10 or 20 stars. Maybe 15 stars in 14 days would’ve been enticing, but 25 stars in 14 days is just too much. 1 star away! Does anyone know if we have tomorrow too? I hate when they say ‘ends Feb. 11th’ does that mean through or not? Thanks!! I got the 4/10 7/20 offer and just completed it today. I had gold until June of 2014, and will reach 30 stars with this promotion. Will I renew for June of 2015 or February of 2015? My impression with this Star Dash is that whether you got the email invite to participate was random, but the content – meaning your specific dash – was not random. If you randomly received an invite, your dash was based upon some kind of previous transaction history. I go once or twice a week and I got the 7-star dash…4 for 10 and 7 for 20. My Star Dash was for 10 bonus stars when I earn 6 stars. For $6.00, I was able to earn 16 stars total (6 stars + 10 bonus), bringing down my stars from 24 to 8 to remain gold. Did this by purchasing the Via Latte sample packets for $1 each and paying for them in 6 separate transactions in 2 visits. 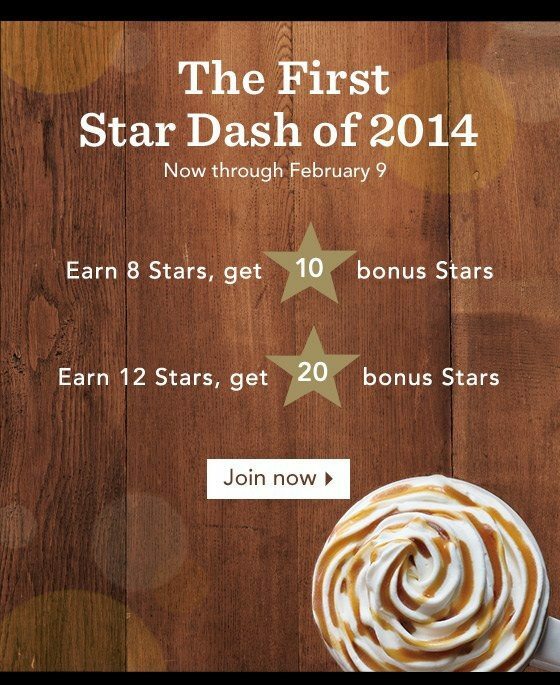 I don’t visit Starbucks often (1-2 times per month) so this star dash really helped. My gold level ends in January so usually I’m trying to hurry and get to 30 stars in December. Now earning the remaining 8 should be easy. I thought if I complete 8 I would get 10bonus stars…. I completed 9, but it said I didnt finish the dash…. so I went to Starbucks 3times a week for no bonus…. Mine was the 8 for 10, or 12 for 20. I completed and received 8 stars by Feb. 11th. But now it said that I didn’t finish the dash in time. Was there a “hidden catch” ? That will be the last time I fall for that promo. You will receive the bonus stars. Someone on twitter had the same issue and Starbucks replied and said that they will be receiving the bonus stars. It just wasn’t worded right. 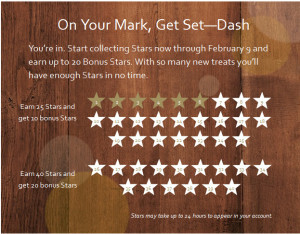 If you don’t receive the bonus stars after February 18th, email or call Starbucks so that they can credit you. For a big company like Starbucks, it seems like they are always having issues with their site and accounts. A few months ago I stopped receiving emails when a coupon becomes available to use even though my email preferences is set correctly and my junk mail folder is empty. And last year, I participated in the Star Dash twice and never received my bonus so I had to contact Starbucks to have it credited to my account. I had the 40 stars earn 20. Whew! I’m so competitive with myself I bought chocolate covered almonds on the last day for valentines gifts and had the poor barista ring all 22 up. One. At. A. Time. Yikes! @Kenneth – Me too! Just got my 20 stars. Congrats Kenneth on making your Star Dash! Hoping I get the email with the code. Still waiting. Been having issues with my Starbucks account since last year. Last year I participated in the star dash twice and was never credited with the bonus so I had to call them each time to credit me. Then a few months ago I’ve stopped receiving email notifications when I have a coupon available in my account even though my Starbucks email preferences are all set correctly, checked my junk mail folder, blocked senders list, etc. Got the code and put it in, but have not yet received the stars. Anyone else put the code in but not get he stars? I received my 20 bonus stars however I was only 4 away from getting a free drink so with the bonus of 20 stars I should have received 2 free drinks however I only received 1. The 20 stars finally showed up on my account, but I did not receive any free drinks yet. I wonder if there is a problem? I received 2 reward drinks/food (expires 3/28) with this promotion. It also get me another year of Gold level. In addition to that I have a birthday reward too. I also got an email for 6 bonus stars as an incentive to use auto-reload. The bonus stars campaign starts off pretty strong. Hi Melody. I found your website while googling about Starbucks and the Dash program. You have some great info! I sent you a cup of coffee for your interesting work. So – how about telling us about the badges? Thanks again. @John Taylor – Thanks for finding this website. I don’t think those badges mean much. Do you use Foursquare? I do. I have a Foursquare profile, and that app is very heavy on badges, but at the end of the day, they don’t do anything. You can’t redeem a badge for anything. It really looks like when Starbucks created badges they were following in the footsteps of Foursquare. People like the badges just for fun. John please come back soon, and if you haven’t already, I hope you’ll “like” this page too. Thanks for the reply. Good point about the badges, whose function slowly dawned on me – gamification. Here’s a link to a US News & Report (11/20/2013): “What Starbucks Gets About Loyalty”. And yep, definitely liked your Facebook page. hi… i just get into a gold level and i saw the message from STARBUCKS it takes 4 to 6 weeks to receive the card. but i didnt still get that by mail. do you knw whom do i need to talk? or…need to keep waiting till i got the mail? Question. I was curious, after completing the May 2014 Satr Dash, how long typically does it take for the extra stars to show up in your account? I thought it ended on May 27th? Thanks! One thing I’ve noticed with Starbucks is if you are in the middle of a dash/promo for bonus stars, early on, they will post your earned stars within 24 hours. And for some reason, they usually get posted even faster if you purchase at a non-O&O franchised store. But the closer you get to the finish line, the slower the star posts become. I just wrapped up the 3, 5, or 7 days in a row bonus (I did 7 days) and the last couple of stars took 4 days to get posted. They did the same thing with the last bonus star promo they did. I think they like to keep people thinking they are one or two stars away when they’ve actually completed the promotion’s requirements. Now I have to wait about two weeks to receive the code to claim my 7 bonus stars. Really, Starbucks? 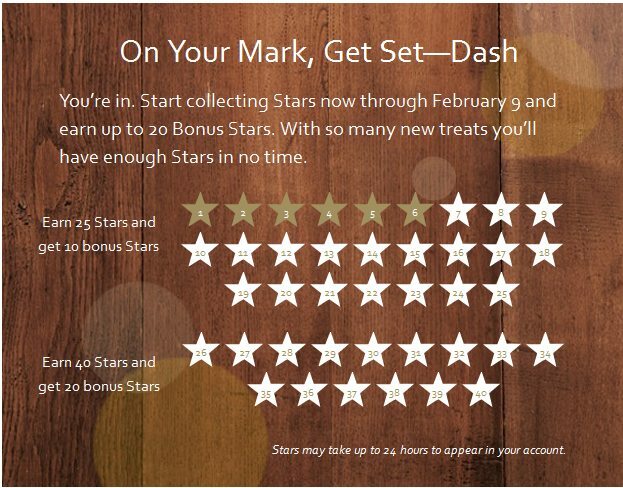 I’ve signed up for and completed 3 Star Dashes and ONLY the first one worked with Starbucks sending the Star Bonus email as promised. I’ve had to track down the second one and they made good on it and am in the process of having to track down the last one. Frustrating…. When you are participating in a star-dash or bonus star promotion is there anywhere you can go to see how far along you are earning stars? I know all promotions are different but it would be nice to be able to see where you are at.